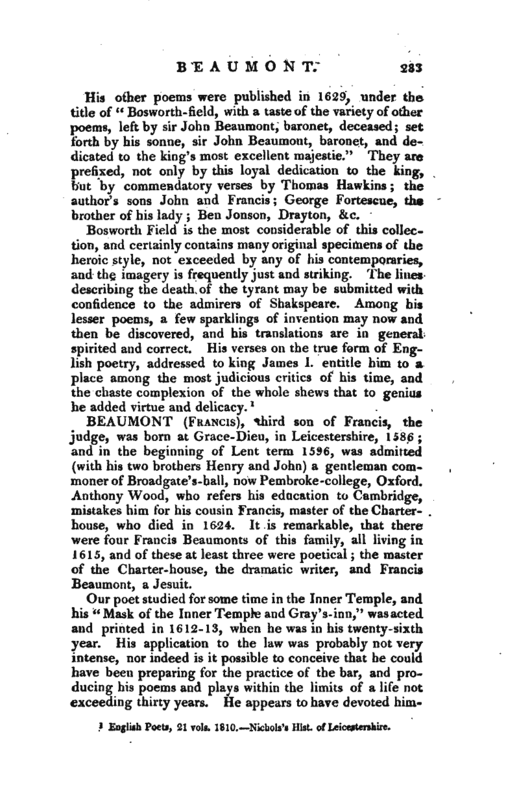 , third son of Francis, the judge, was born at Grace-Dieu, in Leicestershire, 1586; and in the beginning of Lent term 1596, was admitted (with his two brothers Henry and John) a gentleman commoner of Broadgate’s-hall, now Pembroke-college, Oxford. Anthony Wood, who refers his education to Cambridge, mistakes him for his cousin Francis, master of the Charterhouse, who died in 1624. It is remarkable, that there were four Francis Beaumonts of this family, all living in 1615, and of these at least three were poetical the master of the Charter-house, the dramatic writer, and Francis Beaumont, a Jesuit. Our poet studied for some time in the Inner Temple, and his “Mask of the Inner Temple and Gray’s-inn,” was acted and printed in 1612-13, when he was in his twenty-sixth year. His application to the law was probably not very intense, nor indeed is it possible to conceive that be could have been preparing for the practice of the bar, and producing his poems and plays within the limits of a life not exceeding thirty years. He appears to have devoted | himself to the dramatic muse from a very early period; but at what time he commenced a partnership with Fletcher, who was ten years older, is not known. The date of their first play is 1607, when Beaumont was in his twenty-first year; and it was probably acted some time before. He brought, however, into this firm a genius uncommonly fertile and commanding. 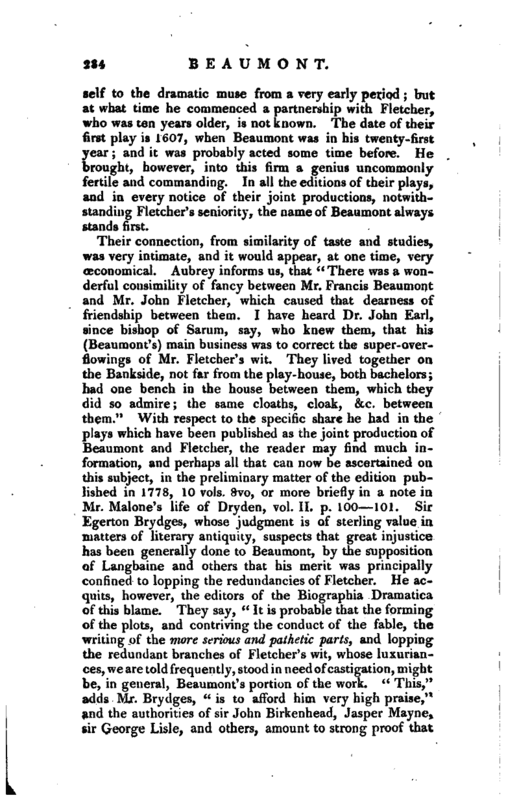 In all the editions of their plays, and in every notice of their 4 joint productions, notwithstanding Fletcher’s seniority, the name of Beaumont always stands first. Their connection, from similarity of taste and studies, was very intimate, and it would appear, at one time, very Œconomical. Aubrey informs us, that “There was a wonderful consimility of fancy between Mr. Francis Beaumont and Mr. John Fletcher, which caused that dearness of friendship between them. I have heard Dr. John Earl, since bishop of Sarum, say, who knew them, that his (Beaumont’s) main business was to correct the super-overflowings of Mr. Fletcher’s wit. They lived together on the Bankside, not far from the play-iiouse, both bachelors; had one bench in the house between them, which they did so admire the same cloaths, cloak, &c. between them.” With respect to the specific share he had in the plays which have been published as the joint production of Beaumont and Fletcher, the reader may find much information, and perhaps all that can now be ascertained on this subject, in the preliminary matter of the edition published in 1778, 10 vols. vo, or more briefly in a note in Mr. Malone’s life of Dryden, vol. II. p. 100—101. 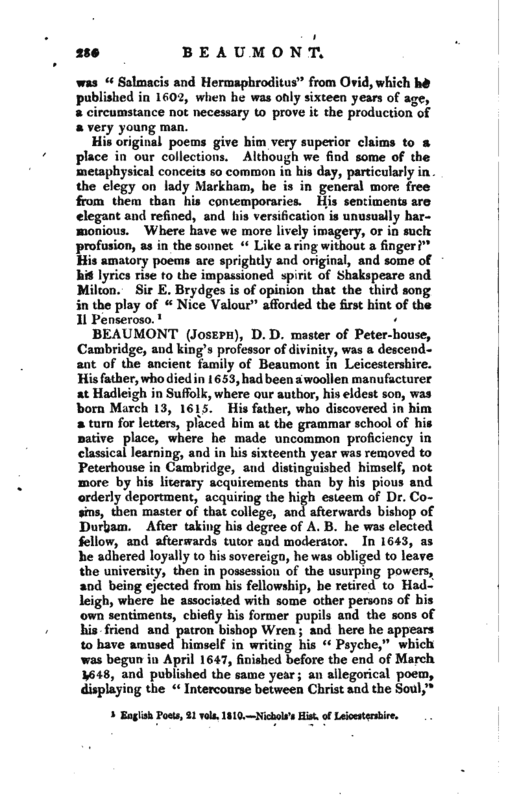 Sir Egerton Brydges, whose judgment is of sterling value in matters of literary antiquity, suspects that great injustice has been generally done to Beaumont, by the supposition of Langbaine and others that his merit was principally confined to lopping the redundancies of Fletcher. He acquits, however, the editors of the Biographia Dramatica of this blame. They say, “It is probable that the forming of the plots, and contriving the conduct of the fable, the writing of the more serious and pathetic parts, and lopping the redundant branches of Fletcher’s wit, whose luxuriances, we are told frequently, stood in need of castigation, might be, in general, Beaumont’s portion of the work.” This,“adds Mr. Brydges,” is to afford him very high praise," and the authorities of sir John Birkenhead, Jasper Mayne, sir George Lisle, and others, amount to strong proof that | he was considered by his contemporaries 'in a superior light, (and by none more than by Jonson), and that this estimation of his talents was common in the life-time of his colleague, who, from candour or friendship, appears to have acquiesced in every respect paid to the memory of Beaumont. How his life was spent, his works show. The production of so many plays, and the interest he took in their success, were sufficient to occupy his mind during his short span, which cannot be supposed to have been diversified by any other events than those that are incident to candidates for theatrical fame and profit. Although his ambition was confined to one object, his life probably abounded in those little varieties of hope and fear, perplexity and satisfaction, jealousy and rivalship, friendship and caprice, which are to be experienced within the walls of a theatre, and compose the history of a dramatic writer. He appears a satirist on women in some of his poems, but he was more influenced by wit than disappointment, and probably only versified the common-place raillery of the times. He married Ursula, daughter and co-heir of Henry Isley of Sundridge in Kent, by whom he had two daughters. One of these, Frances, was living at a great age in Leicestershire, in 1700, and at that time enjoyed a pension of lOOl. a-year from the duke of Ormond, in whose family she had resided for some time as a domestic. She had once in her possession several poems of her father’s writing, which were lost at sea during her voyage from Ireland. Mr. Beaumont died early in March, 1615-16, and was buried on the 9th, at the entrance of St. Benedict’s chapel near the earl of Middlesex’s monument, in the collegiate church of St* Peter, Westminster, without any inscription. The first edition of his poems appeared in 1640, 4to, and the second in 1653, but neither so correct as could be wished. 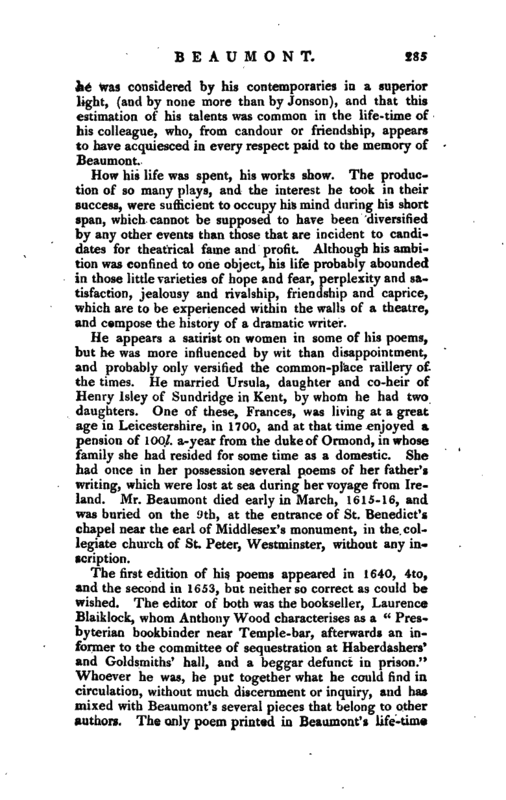 The editor of both was the bookseller, Laurence Blaiklock, whom Anthony Wood characterises as a “Presbyterian bookbinder near Temple-bar, afterwards an informer to the committee of sequestration at Haberdashers’ and Goldsmiths’ hall, and a beggar defunct in prison.” Whoever he was, he put together what he could find in circulation, without much discernment or inquiry, and has mixed with Beaumont’s several pieces that belong to other authors. The only poem printed in Beaumont’s life-time | was “Salmacis and Hermaphroditus” from Ovid, which he published in 1602, when he was only sixteen years of age, a circumstance not necessary to prove it the production of a very young man. English Poets, 21 vols. 1810. Nichols’s Hist. of Leicestershire.